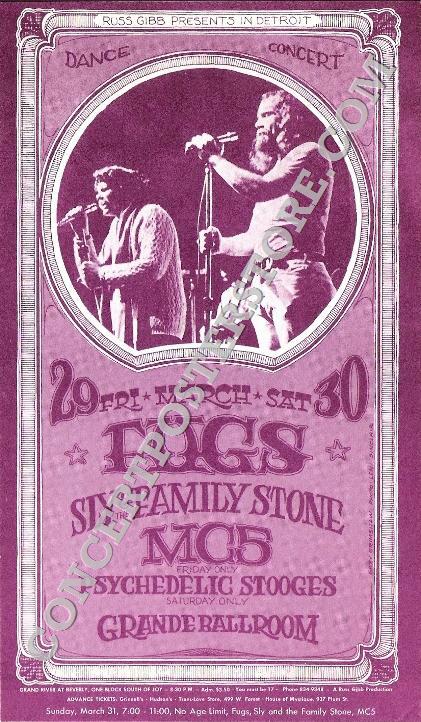 Original 1st/only printing 4 x 7" concert postcard for the Fugs with Sly & the Family Stone, the MC5 and the Psychedelic Stooges (with Iggy Pop) at the Grande Ballroom in Detroit, MI on 3/29-30/1968. Art by Gary Grimshaw, image is #76 (card #29) in the Russ Gibb Presents/Grande series. Medium thin flat stock card is in superb mint/near mint (A/A-) condition.